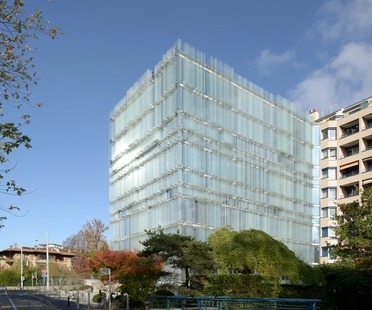 2b Architectes of Switzerland designed the Jolimont Nord offices in Mont-sur-Rolle, on Lake Geneva. With the hilly landscape of Mont-sur-Rolle in mind, 2b Architectes designed clear and polychrome façades for the Jolimont Nord offices. Love of detail: a doorway in the city centre. This work of precision by the Swiss architecture firm, Bureau A, highlights the beauty of traditional craftsmanship and enhances urban property combining contemporary working methods and local references. A sauna on the rooftops of Geneva. Bureau A. What to do with the extra space on an old factory rooftop? Build a small multipurpose sauna, of course! This is the response of Daniel Zamarbide and Leopold Banchini, the architects from the Swiss practice Bureau A who came up with the project. Built by the South African studio SAOTA on the shores of Lake Geneva, the building has been described by one of the architects as an expression of an emerging African aesthetic because of its play of textures, materials and how they are connected with the world outside.